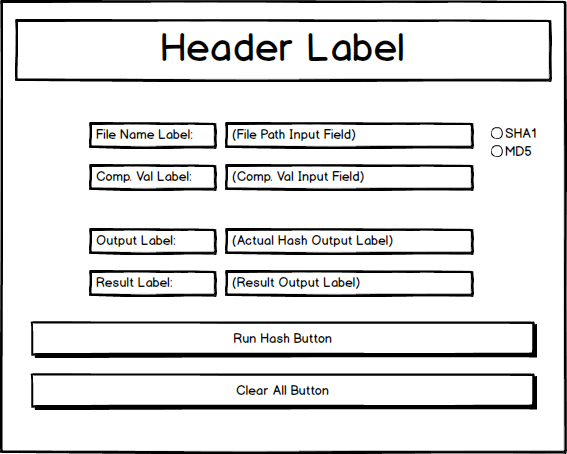 In this tutorial series, we are going to build a simple file hashing application using the Python standard library's interface to the TK GUI toolkit: tkinter. One can find some resistance to using tkinter in the Python community. However, my interest in tkinter was recently rekindled after watching "Tinkering with Tkinter", a presentation by Russel Keith-Magee, in which the Django developer makes a strong case for revisiting this often overlooked and under-appreciated component of the Python standard library . . .
As Keith-Magee points out, these days tkinter has a number of arguments in its favor: 1) it is in the standard library, 2) it has been greatly improved in recent years, with additions to its basic functionality (more widgets!) as well as improvements in the look and feel of the GUIs it can generate, and 3) new resources such as the website TkDocs provide a ton of information to get Python tkinter GUI apps up and running in a relatively short period of time. Keith-Magee walks the walk as well, having built Cricket – a GUI tool for running Django and Python test suites – entirely with tkinter. With that determination, we can already specify the basic functionality that we'd like our tutorial application to have. It should be able to: 1) generate hash digests of a specified file, 2) check the result against a known hash value, 3) alert the user as to whether or not there is a match, and 4) provide a choice of hash functions to use in the process. We are going to use Python 3.4 throughout, but much of the code that follows should also work in Python 2.7, and I'll try to provide pointers as to when and why it might not. In case anyone is interested, I'm building this using the PyCharm Free Community Edition IDE on a Macbook laptop. Please note, there may be, or rather, it is virtually certain that there are far better ways to code the application presented in this tutorial. I built the GUI on the basis of my own idiosyncratic research into the tkinter library, and have organized the project to make it easier to present and digest in this tutorial series. Thank you for useful post. It's great to learn somwthing new, that can be helpful. It can help in studying, for example at university. By the way, if you're studying at university here some new writing tools. Your style is unique in comparison to other people..